If you have not yet done so, please renew your CEHS membership, or become a member for 2018 here. 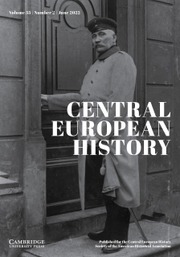 Central European History offers articles, review essays, and book reviews that range widely through the history of Germany, Austria, and other German-speaking regions of Central Europe from the medieval era to the present. All topics and approaches to history are welcome, whether cultural, social, political, diplomatic, intellectual, economic, and military history, as well as historiography and methodology. Contributions that treat new fields, such as post-1945 and post-1989 history, maturing fields such as gender history, and less-represented fields such as medieval history and the history of the Habsburg lands are especially desired. The journal thus aims to be the primary venue for scholarly exchange and debate among scholars of the history of Central Europe. Hitler and Film: The Führer's Hidden Passion. By Bill Niven. New Haven, CT: Yale University Press, 2018. Pp. 295. Cloth $30.00. ISBN: 978-0300200362. Letter from the Editor: The Incredible Shrinking Century? The Third Reich's Intelligence Services: The Career of Walter Schellenberg. By Katrin Paehler. New York: Cambridge University Press, 2017. Pp. xii + 372. Cloth $120.00. ISBN 978-1107157194. Modern Hungers: Food and Power in Twentieth-Century Germany. By Alice Weinreb. Oxford: Oxford University Press, 2017. Pp. 328. Cloth $55.00. ISBN 978-0190605094. The German Studies Association has issued a call for 2018 seminar proposals - please read more here and apply here.